Earlier today news was broken by Axios that uBeam founder Meredith Perry had "stepped down" as CEO to spend more time with her family... I mean make way for a more seasoned CEO. As always seems to happen with big uBeam stories, I had work commitments that meant I had barely a few minutes to type up a post as it happened, so I'm only just getting to my thoughts on this late at night. Now bear in mind I have access to no more information than any of you on this event, so this article is simply my best guess based on knowing much of the history and the personality of the people involved. Meredith Perry has decided to step down as the day-to-day CEO of uBeam and will assume a role as a senior advisor and an active board member at the company. Having overseen uBeam from its inception through its development of a functional working product, Meredith felt it was time to bring on a seasoned executive in the electronics field to lead the company through its commercialization phase. The company has begun a search for this new CEO. The official accounts are very professional, making it clear that it was absolutely the decision of Perry herself to step down, praise for her great ability, and positioning that her stepping aside is actually a new era in the company. A bold step that bodes well for the future! Yeah, right, that'll be why Suster's tweets seem to quietly admit they've abandoned the phone charging thing, which is pretty sad considering they raised $10 to $14 million dollars on that promise less than a year ago, and (by my guess) around $37 million promising over the lifetime of the company. So let's take much of this in turn - first of all the Perry I thought I knew would never, ever, in my opinion, voluntarily step down from her position in the company. If an interviewee for a senior role ever asked if she might consider stepping into another role in the future as the company grew into a new phase, it appeared to me as if that ended any chance of a job offer, no matter how talented or capable they otherwise were. In describing her role I would hear her talk about "the mission" and her "destiny" to bring wireless power to the world. I always felt that in Perry's mind, she was uBeam, and uBeam was her, and given how much stock I believe she held in the company at least when I was there, legally that was pretty much true. A "functional working product" made me raise an eyebrow. If they had that, I'm pretty sure an Apple or Google would have taken them off the field by now, and neither would they be moving from "consumer-facing mobile charging to b2b licensing for IoT". A functional working product that could charge a phone at 15 feet and faster than a wire would not be pushed to IoT (Internet of Things), in my opinion. 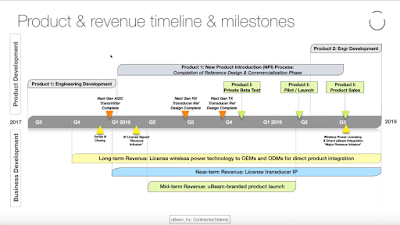 As I've commented in the past, pointing at Energous and Ossia, there's a pattern to the at-a-distance wireless power companies of initial bold claims of producing devices working at multi-meter distances and multi-Watt charging, then to 'trickle charge', then to a licensing model, then to IoT. I would expect at some point investors just don't buy that the 10 to 100mW charging levels under good conditions will work for phones, so the business model shifts to saying IoT because you can make some half-baked argument it'll work, right up until it doesn't. In my opinion, if you want an IoT charging option for distance, that's low cost and been on the market for years, and you only need micro- to low milli-Watt charging, look at Powercast. Basically, what they have works and none of the other options, to me, offer anything better (but some possible big downsides). 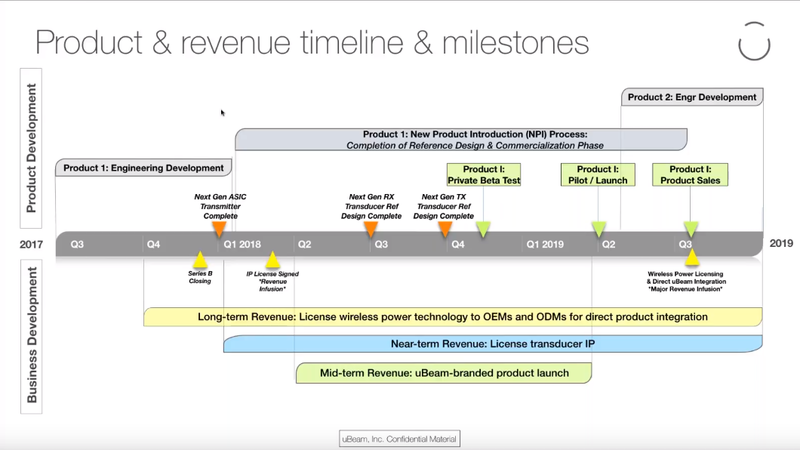 Taking a look at uBeam's product roadmap from the last fundraising round, you can see that by now they should have completed multiple new transmitter and receiver designs, licensing deals, and about to start a private beta test, with a product launch starting early next year. I'll just quote Techcrunch here saying "repeatedly missing self-imposed deadlines" and leave it there. The "begun a search for a new CEO" line is interesting, as normally that line is "and introducing our new CEO" or "long serving COO steps into this role" or similar. Problem is that uBeam has bled senior executives - by my count it's 1 CEO, 1 CFO, 2 CTOs, 2 COOs, and 3 VP Engineering that have departed, and that doesn't include the other staff. The COO who left most recently (according to LinkedIn), around May 2018 after barely 9 months on the job, had an extensive background in IP licensing and would have been perfect for a role to transition to "b2b licensing for IoT". To me, there's a red flag here, if this were well planned out and in a well running company, I'd expect to see a smooth handover to an experienced executive happy to take on the role, and you don't hand it over to the head of HR, no matter how talented they are, they're not the right choice for a tech company looking to do licensing deals. Next thing that I notice is not what is said, but what is not said. Where's the quote from Perry herself? These releases usually have something from the founder/CEO saying "It's been the honour of my life to grow this company and build this team, but I feel my talents best serve the investors on the board and evangelizing for the company, and I leave it in the capable hands of my successor." but this time - nothing. From Constine's article "TechCrunch spoke to Perry but she declined to comment on the record." is interesting, there wasn't even the prepared one liner to hand out. Nada. Zilch. Nothing... Hmmm. Update 9/21/18: Perry tweeted a short statement after close of business yesterday, which managed to say very little but was at least professionally written. Still strange this wasn't prepared ahead of time, it's the sort of thing that takes a few minutes to prepare and is standard in this type of situation. End of update, back to the original post. So jumped or pushed? I don't know, but this doesn't smell to me like a regular founder transition. I'll leave this post with a story about my time at uBeam, and specifically my last day at the company, in October 2015. Things had been untenable for some time prior, and I had exhausted every route available in trying to correct what I saw as a terrible situation for myself and the company, all the way to the board. I had been interviewing and things were clearly going well enough that I was prepared to go, and had some upcoming personal events I wanted to attend to. One meeting in particular pushed me over the edge, and I told the CEO that I was extremely unhappy, and we should discuss a way to amicably separate. I knew the transducer and acoustics side better than anyone, and would give the company as much time as needed to transition and pass over my knowledge. It was a tense meeting, and I went home after, and there were then a series of ... interesting ... emails and phone calls with Perry, that ended with no conclusion. Ironically, among the demands from the company was a statement for the press about how I still believed in uBeam's goals and the technology, but I declined. I got a text the next morning to come to the downstairs company conference room, and to bring my laptop, lab-book, and any company property - it was clear what was about to happen. "Today will be your last day with the company. But before we go on to that, it is important that you understand that you are a quitter. You have quit on me, you have quit on yourself, you have quit on the company, you have quit on your team, you have quit on.... wait what are you doing?" At this point the speech was so ridiculous I had picked up my phone to start taking notes because this was too good not to write down. I looked up and she seemed shocked and demanded "Are you texting someone? I'm talking." and I looked at her and said "Just taking some notes." Sadly, this seemed to throw her off, and I never did hear the rest of that prepared speech. She simply mumbled then moved to telling me that I would now give an exit interview, and was again perturbed when I declined. She insisted and the CFO, acting as HR, had to step in and say that wasn't necessary. I handed over my laptop and the few items I had, and made a clear instruction that the company was not to make any statements or quotes that were to be attributed to me - I heard from the team that about ten minutes later they were all told in a company meeting by the CEO that "I wanted them to know that I wished them all the best and success for the company, and still believed in the company mission" or something similar. "Today is your last day as CEO of this company. But it is important that you understand that you are a quitter. You have quit on yourself, you have quit on the company, you have quit on your team, you have quit on.... well, you'll have to look at your own notes for who else you quit on. Oh, and the exit interview is optional." Meredith Perry has stepped down as CEO of uBeam, the controversial wireless charging startup she founded in 2011.
uBeam wants to commercialize its technology via licenses to embed it in third-party products, and Perry was not viewed as the right person for that task. Perry will remain a "senior advisor" to the company and on its board of directors. I didn't think that Perry would ever willingly step down, so if I am correct there, this was forced by investors after failing to meet milestones. I'm certainly surprised it happened this early after the last round. More comment as I learn more. You can find my uBeam posts here and more detailed thoughts on this event in a much longer post. Update 25th Nov 18: The interim CEO and VP of Finance and HR lists herself on LinkedIn as being in the Interim CEO role since July of this year, whereas this announcement came in September. Mistake, or was Perry on 'gardening leave' since July and it was only made public in September? (Thanks to sdpkom on EEVBlog for spotting this). She's also, apparently, still CEO of Cubed Communications, so that's 2 CEO and 2 VP roles simultaneously! In the wake of a high-profile scandal, the company will formally dissolve, according to an email to shareholders. Theranos will seek to pay unsecured creditors its remaining cash in coming months, the email said. Most of Theranos’s two-dozen remaining employees worked their last day on Friday, Aug. 31. All told, investors in Theranos have lost nearly $1 billion. I think it's all been said in previous Theranos posts. Nothing more to add really. Now to see what happens in the court cases. In late 2016 I wrote a post on Magic Leap, the company that had raised billions of dollars for its Augmented Reality (AR) product, which they promised would be so far beyond anything else it would be like magic. Journalists fawned over them, willingly signing NDAs just to get a peak and then allow the company to decide what they can say (hint: if a journalist admits they signed an NDA with the company they are covering, they are simply, IMO, a stenographer and mouthpiece for PR whitewashing). It was amazing, and we had wonderful insights into the amazing character of the founder Rony Abovitz, and learned that he met Beaker from the Muppets, a factoid so compelling it could be used 18 months later to fill column inches and avoid talking about the technology and failure to deliver. By the end of 2016 a lot of questions were starting to be raised about the extent of their promises, and that videos they had claimed were actual AR turned out to be more a rendered version and not truly representative of what would be seen by a user. The company got very defensive, understandably, and the CEO put out a statement that users would get an experience "powered by unicorns and rainbows" (It looks like that blog post has been taken down, but excerpts are here). We should be praising companies and people that try. Especially new companies that want to break the Google/Apple/Microsoft mold we are currently trapped in. We should celebrate their success and encourage them when they struggle. We should acknowledge that ambitious things are hard and not expect too much of them (something I am certainly guilty of)." Anyway - it's nearly two years later and Magic Leap are finally releasing a product, their Magic Leap Creator One, and for $2300 you can get the package with the eyewear (Lightwear), the portable/wearable computer/GPU that drives it (Lightpack), and the handheld controller. Along with the $500 "professional development package" this is broadly the same price range as the Microsoft Hololens, their AR offering, which came out 2 years ago. Various tech media have reviewed it and given it a resounding shoulder-shrug, and mostly "Meh, nice start, might be awesome in the next version though". I'd love to review it myself, with a more technical eye, but quite frankly I'm not going to pony up $3k for the privilege. Fortunately, someone with a lot more understanding of the in-and-outs of VR and AR has already done this. There's an explanation for each of his points, it's well reasoned. He praises them where they deserve, and it seems at the end had it not been for the ridiculous PR and billion dollar funding the response might have been "Nice first shot, a little better than the Hololens, great to see some competition". Luckey makes points beyond the technical though, and that's really the bit I want to concentrate on as it's part of the larger picture of tech funding and tech media coverage. He shows this image that was used by Magic Leap in promotion of their tech, and comments on it. 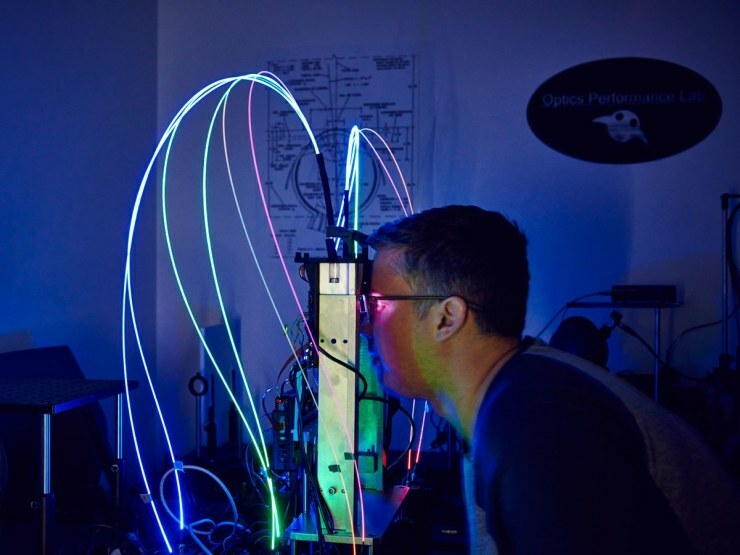 "Above is a telling picture from a piece Magic Leap did with Wired magazine a couple years ago, back when they were still hyping up scanning fiber displays. See the fancy-looking, high-tech light up strands? They don’t do anything. It is just electro-luminescent wire. It looks great to casual observers, but does not hold up to any kind of scrutiny from people who are in the know." Basically, you're being lied to. Shiny things and glitter are supposed to make you say "ooh" and "aah" and think it looks cool. But there is a more insidious side to this, as once you are invested in liking it, thinking it's awesome, when an expert comes along and rubbishes it, you take it personally. Like the victim of a con, rather than admitting you were duped, you double down and take the side of the conman. From then on, you are a member of a "tribe" and it becomes "us against them", the "believers vs the heretics" and it's no longer about the tech or the business, but about belief. You're far enough in the hole you're just going to keep digging. Once you're there, there is no amount of data or evidence that will budge some of these people. Look at Tim Draper even after Theranos has been proved to be a fraud, he's still claiming it was just because a journalist and the government were out to get the CEO. "Their current offering is a tragedy in the classical sense, even more so when you consider how their massive funding and carefully crafted hype sucked all the air out of the room in the AR space... It does not deliver on almost any of the promises that allowed them to monopolize funding in the AR investment community." This echoes a point I have been making in this blog over the last couple of years - certain companies like Theranos or Magic Leap come to the table with bold claims of advancements vastly beyond what anyone else offers, with "Star Trek" levels of capability. Their charismatic founder gets puff-pieces in the tech press, with little scrutiny of the actual technology - which, of course, is a closely guarded secret you can't be allowed to see. They get huge amounts of funding, and the common wisdom quickly becomes "They've already won, how could you compete with them?" Theranos are clearly in the realm of fraud, Magic Leap perhaps is more "extreme exaggeration", but the chilling effect on entrepreneur funding is the same at the outset. "It creates the standard by which all other companies now must be compared. Imagine you've a small company with solid VR technology that actually works and can be delivered as a product, but when you present it to a VC you're told "Magic Leap already beats that - I won't invest, there's no market". Because you are honest, you don't get funding and your company never takes off, we as the public don't get the benefit of that technology, and the VC's investors (like pension funds) don't get the benefit of the profits. Worse, it encourages the less-than-honest founder to "exaggerate" capabilities and exacerbates the problem. As a society we all lose from this." And this is the key for me - on the one hand you can't blame a company for putting the best spin they can on what they have, it helps with fundraising and recruitment, and harms potential competition - however there is no excuse for the tech media (at least the ones who claim to be reporters and not in it for page clicks alone) to enable this, nor for institutional investors to fund in a way that encourages the less-than-honest (or above-average delusional). Perhaps a worse outcome is that when the over-promised thing under-delivers (or delivers fraud), it taints the entire sector for investors and potential employees alike Sure, Magic Leap finally got a product out, but it's was a resounding "meh" and with $2 billion in funding, you really have to work to screw up one delivering something. But what if that something is a negative for the industry overall? As Luckey says "That is not good for the XR industry." How many advances have we lost because media and investors allowed the PR departments of companies to bamboozle both us and them into ignoring a small but capable and honest company? If you're in engineering, you know of many people working on great technologies that struggle to raise because they just don't lie, or are better at the tech than the pitching. It still confuses me that professional investors heavily bias their selection towards the well-connected, gifted presenters and fundraisers, rather than those with the actual capability to deliver a realistic if bold vision.